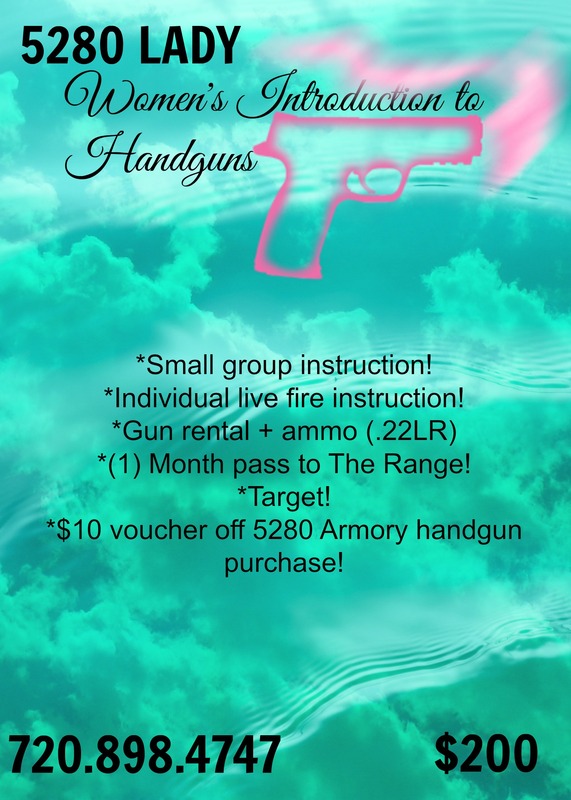 5280 Armory’s Women’s Introduction to Handguns is a fun and interactive course specially written for women who are eager to learn the basics of handguns and the sport of shooting! Through this course, students will learn gun safety, the parts and pieces and overall operation of handguns, become able to differentiate ammunitions, develop pistol shooting fundamentals, and become involved in shooting activities! This class will also help to prepare the student for participation in other 5280 Armory courses. BE SURE TO LIKE AND FOLLOW US ON FACEBOOK TO KEEP UP TO DATE ON ITEMS IN STOCK AND FANTASTIC DEALS ON USED WEAPONS! The staff at this range are incredibly friendly, easy going, respectful and helpful. That was the most important part to me. I felt free to really have fun and enjoy myself. The building is very well kept and visually appealing. The range is fantastico! In their shop they have an amazingly large gun selection. 5280 Armory store is a fantastic experience. I just bought a rifle I had been looking all over for. I called the shop, they had the rifle in stock so I went in. First off, their store is impressive. The biggest selection I’ve seen outside of Las Vegas. The store is very well organized by brand and caliber. When I approached the counter a staff member greeted me right away. The rifle I was looking for was in stock as promised and priced VERY competitively (even when compared to online prices). I was also impressed by their selection of collectors forearms too. If you’re looking for a unique piece of history check here first. The 5280 Armory offers a ‘cash’ discount on almost all firearms sold there which is nice. Basically they pass along the savings of not having a credit card transaction fee. The staff overall was friendly and knowledgeable. I’ll definitely be driving the 30 minutes from home to make ALL my future purchases here. They are definitely worth the drive. I’ll be back soon to check out their indoor range, hopefully it’s run as well as the 5280 Armory store. In 15 years, 5280 Armory has continuously broken the mold by gun shop standards and has since become Colorado’s Gun Shop! Our inventory is second to none! With over 2,000 rifles, shotguns and handguns in stock, our inventory speaks for itself (Click here to see what others have said, REVIEWS). Enjoy an exciting shopping experience in our massive 4,300 square foot retail shop packed with your personal protection, marksmanship, and hunting needs, continuously unsurpassed in selection and service in the Denver area! We are also Colorado’s premier Class III dealer. 5280 Armory stocks transferable full auto weapons, ear protecting suppressors, and short barrels from most of the major industry manufacturers. If we don’t have it, we will be happy to order it! Also, we are non-commission based, so rest assured that our friendly and experienced team will help you choose the right firearm to meet any special requirement you may have. Most exciting of all, you can use our brand new and now open indoor and onsite shooting range, The Range at 5280 Armory, to “try before you buy” from a diverse selection of rentals, including full autos! THE STORE AND RANGE HAVE DIFFERENT HOURS!!! !